I would like to know difference between Biztatlk - host, host instance and application. BizTalk Host is a logical containter where you deploy your BizTalk Services such as Orchestration, send and receive and adapter handlers. And BizTalk host instance are in fact the physical container where the services run. You have two type of hosts, inprocess and isolated. Inprocess host are used for services running inside the biztalk and can be managed using BizTalk admin, while isolated hosts are used for HTTP, asp.net processes which are potentially running outside the BizTalk services. Thus you create a Host and then you create a host instance. Unless the host instance is not created and started you dont have a service to process your BizTalk work. A host instance is responsible for creating the connection between your Biztalk service and BizTalk databases. You can load balance your biztalk application by creating more no of hosts and you can segregate your orchestrations, ports into different hosts. Creating more no of hosts can slow down your system as well thus the decision to create more host should be based on message traffic and real need of extra hosts.Also you can create only one host instance per host on one server. Please refer below articles for more details. 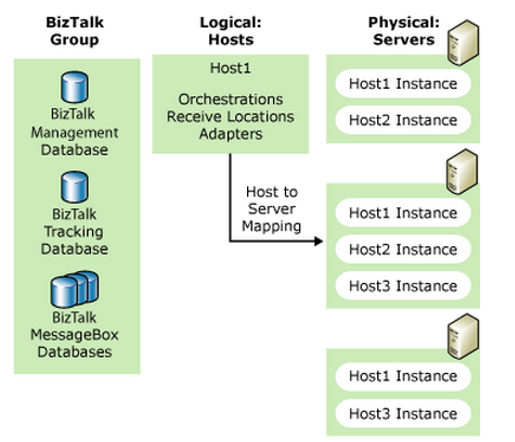 A BizTalk application is a logical grouping of all the BizTalk Server design-time artifacts (schemas, maps, pipelines, orchestrations), messaging components (receive ports, receive locations, send ports) and other related items, such as policies that comprise an integrated business process. BizTalk Server applications simplify the deployment and management of BizTalk Server–based solutions. A BizTalk Host is a logical concept - it is a logical container which you define for the execution of your BizTalk artifacts like pipelines, orchestrations, maps, etc. After creating a Host, you can use it to create Host Instances out of that Host across multiple servers in the BizTalk Group. A Host is a template for the actual process/Windows service that will actually execute your BizTalk code - this physical process/Windows service is called a Host Instance. A BizTalk application is a logical grouping of related assemblies that can contain artifacts like maps, schemas, orchestrations. An application allows the management of these logically related artifacts such as Start/Enlist/Unenlist/Stop, etc. You can also package an application in an MSI which allows for import/export from one environment to another. A Host is like a class it defines properties global to all instances of that host and a Host Instance is a running process that actually does things. In-Process host instances are Windows services and isolated host instances are normally IIS application pool processes, although you can create your own isolated host instances. You define the hosts that you wish to use, then you can create host instances and assign these to a particular server in your BizTalk group. e.g. If you have 3 BizTalk servers in your group, you can define a host for your application, say MyApplicationHost. You can then create host instances for two of your servers, but not the third. Your BizTalk application will only be processed on the two servers that have your host instance. You can allocate host instances to manage load. nload the same files. In this case you can use clustering to switch servers in case of failure. Other receive locations such as web services can be run in hosts instances across multiple servers. You can use network load balancing to distribute load across all servers and to handle fail-over in the case of a server failure. The BizTalk application is a feature of BizTalk Server that makes it quicker and easier to deploy, manage, and troubleshoot BizTalk Server business solutions. A BizTalk application is a logical grouping of the items, called "artifacts," used in a BizTalk Server business solution.